With a cast of more than 100, this new production of Woyzeck manages to be both epic and domestic in scope. One moment the Birmingham Rep stage is packed full of smiling dancers and the next it's a taut drama between two people. And this contrast between maxi and micro serves to concentrate the focus all the more on the small but tragic drama taking place at its core. Georg Buchner's play takes us into the life of soldier Franz Woyzeck. It begins with him on active duty – a man with a purpose – and it ends with him disintegrating into madness and murder when he no longer knows what his life is for. With the war ended and his relationship with girlfriend Marie teetering, Woyzeck gradually loses touch with reality. The two professional cast members, Thomas Pickles as Woyzeck and Jalleh Alizadeh as Marie, understandably form the anchor of the show. Pickles is outstanding as Woyzeck. His arrival on stage, while still in combat, immediately ensures the audience knows he is odd as he eats peas from a can, tells his comrade Andres the dangers of mobile phone surveillance and blathers on despite them coming under gunfire. But at this point this eccentricity is charming, it's only as his life is pulled apart by people out to exploit his trust and simplicity, that he becomes dangerous. Alizadeh's Marie meanwhile is the typical girl next door. 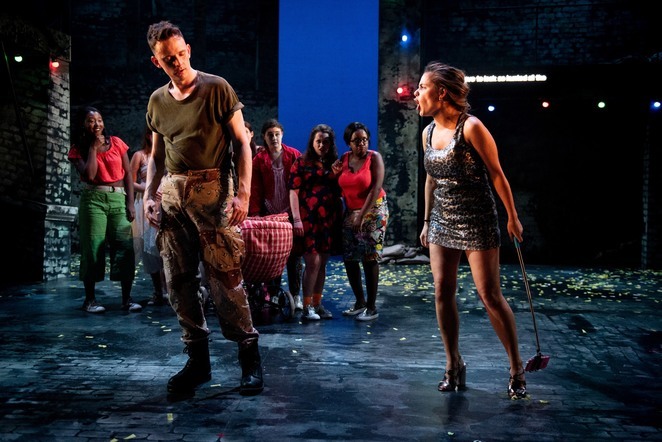 She's been home holding the baby while Woyzeck has been at war and now he is back she wants to get out a bit, have some fun, let her hair down – but her desire for freedom only hems Woyzeck in even more. The community cast have been rehearsing for months and their hard work has paid off. 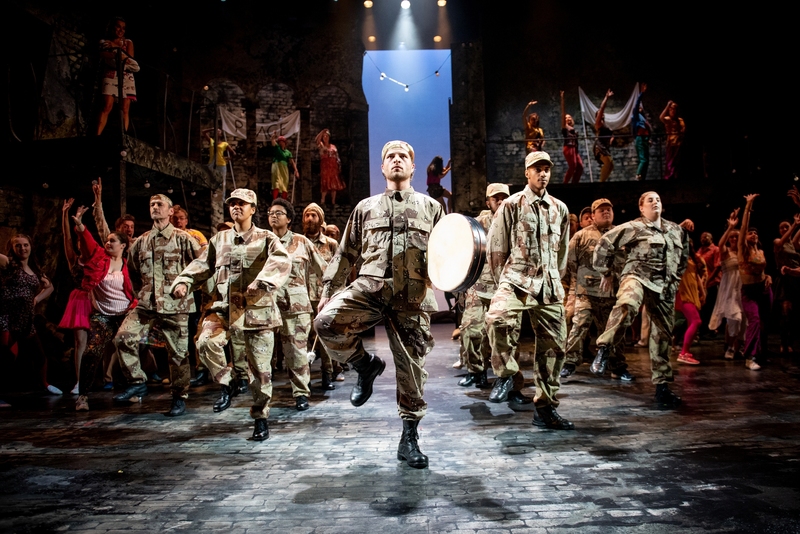 Their enthusiasm shows as they join in dance and deliver their lines so there's a great sense of energy and exuberance on stage – which matches perfectly the sense of a community released from the constraints of conflict. There are also some very strong performances from some of the community cast. It would be hard to guess that Troy Richards as Andres and Josef Hyland as the Drum Major are not in the professional team. Buchner's 1836 play has been brilliantly brought into the modern day in Leo Butler's adaptation. Not only does it pick up contemporary language it's also packed full of modern day cultural references from mobile phones to pop stars. Directed by Birmingham Rep artistic director Roxana Silbert, the show makes full use of the Rep stage and of the community cast. Assistant director and choreographer Rosie Kay has also cleverly made the most of the talents of the cast for the dance pieces blending a host of dance forms including bhangra, salsa and even robotics. Neil Murray's sets move us from battlefield to bedroom with ease and allow plenty of space for the cast to take centre stage. Woyzeck marks the finale of the Rep's Furnace project which aims to create opportunities for the community to be involved in artistic projects and the production also forms part of this year's Birmingham International Dance Festival. Woyzeck plays Birmingham Rep until June 23.